The best way to make sure a woman with RHD has a healthy pregnancy for her and her baby is early diagnosis and cardiac review, collaborative care and communication with family, health workers, maternity and cardiac services. Pregnancy can provide a critical point in time to pick up previously undiagnosed RHD. Apart from missed diagnosis of RHD, other barriers to optimal care can include access to health (particularly cardiac) services, travel and birthing away from Country, with impact on the woman, her family and community. Many women with RHD have healthy journeys through pregnancy with good outcomes for them and their babies. Girls are almost twice as likely to get RHD as boys. 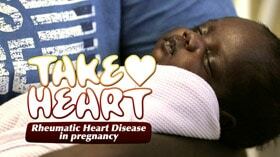 Women are at higher risk during pregnancy because the heart of a women carrying a baby is working harder than normal. Pregnant women who could have RHD should get checked at the clinic as early in the pregnancy as possible. If a woman is prescribed secondary prophylaxis (usually LA Bicillin injections every 21-28 days) it’s essential that she gets the treatment ON TIME, EVERY TIME. This treatment is safe and will not harm the baby in anyway. It’s especially important for women on anticoagulation therapy (eg Warfarin, Coumarin) to have early – and ongoing – review during pregnancy. Preconception counselling is important and can include talking about planning to become pregnant, the time between pregnancies, and possible timing of cardiac surgery and other treatment.